One day, sitting comfortably on the couch (notebook in lap and visiting lots of amazing dog blogs), I noticed Haley had arrived in front of me with her favorite toy, her blue chase ’n chomp squeaky toy. With one hand on the keyboard, I threw the toy across the room like I usually do expecting that we would play a game of one-handed living room fetch but she didn’t move a muscle, she just stared intensely at me. Hmm, weird. I said “Haley, go get your toy!” but instead of chasing after the toy like she normally does, she pointed with her nose to the candy dish beside me on the table. At first I didn’t think too much about the fact that she wanted York Peppermint Patties from the candy dish. She would be a major chocoholic if she were a human. She stood there and continued to stare at me for a minute then scrambled off to retrieve her toy. Again, she brought it to me but this time tossed it into my lap and immediately pointed again to the candy dish. Suddenly, a light bulb went off in my head. Oh my gosh, she’s wanting to trade her favorite toy for a York Peppermint Patty! To test my theory, I threw the toy again to see if it was just my imagination or a strange coincidence, but she again nosed her toy into my lap and told me what she wanted in exchange. Wow! I couldn’t believe what she was doing. 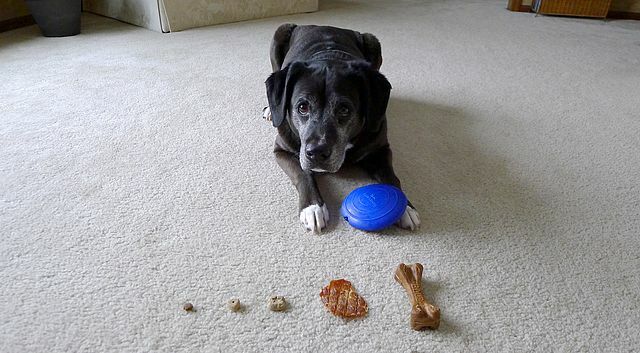 Could dogs possibly understand the concept of bartering? I never really thought about it before that day. I wondered why she never tried to barter with me before, but then I remembered there had been many times in the past when I thought she wanted to play because she presented me with a toy, yet she seemed uninterested when I tried to play with her. I only connected the dots on this occasion because the candy she wanted happened to be right beside me on the table and she could easily point to it right after giving me her canine currency. At that moment, I felt like a dog in training, struggling to understand what my owner was asking of me and then suddenly having the “Aha Moment” when it all clicks! You know that moment when your dog connects the dots and you can almost see it in their eyes, “Oh, that’s what she wants me to do.” That’s exactly how I felt. My dog had been trying to train me for years on how to barter with her but it turns out that she learns a lot faster than I do sometimes. Luckily, she’s a very patient trainer of humans. Since Haley shouldn’t eat a York Peppermint Patty, I decided to give her a choice of treats and in the process, find out exactly how much her coin-shaped chase ’n chomp was worth to her. What is the value of this treasured toy? Q: How much is a chase ’n chomp toy worth in trade? A: One Full Moon Sliced Chicken Jerky treat! Haley makes out like a bandit with her trades because she always gets her toy back after a short period of time. Perhaps this should be a toy lease program instead. 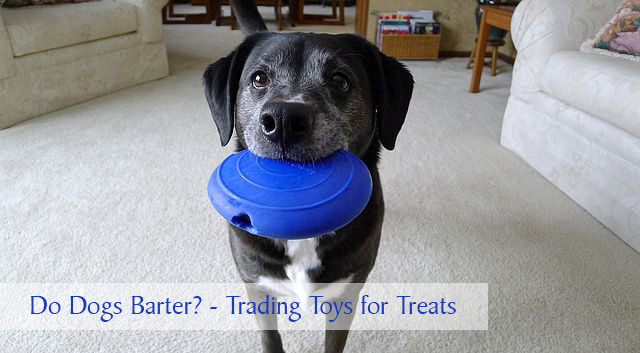 Do dogs barter? Yes, I believe a lot of dogs attempt to trade their possessions for something they want. Have you ever noticed this behavior with your dog? Maybe you figured it out a lot quicker than I did! hahaha! this was great!!!! I think dogs are smarter than people want to believe!!! I wish I knew what they were thinking sometimes…or maybe I don’t really want to know, haha! While my dog hasn’t actively tried bartering like Haley she will trade toys. I think dogs give items some value in their minds and they’re more than willing to trade up when the opportunity prevents itself 🙂 Great article. It’s fascinating that Laika does bartering with toy upgrades. Haley knows where the new toy stash is but has never brought a toy to me to trade up. 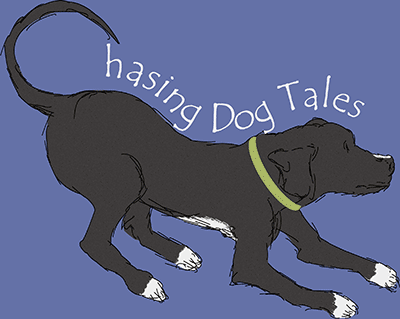 Good story – I definitely think they do – our Sally used to do something similar – she’d pretend she wanted to play, but she just wanted me to go in the kitchen and give her a treat. You’ve launched quite the debate in our household. My husband doesn’t think Honey barters because he can’t think of any item she has solicited by bringing us a toy. 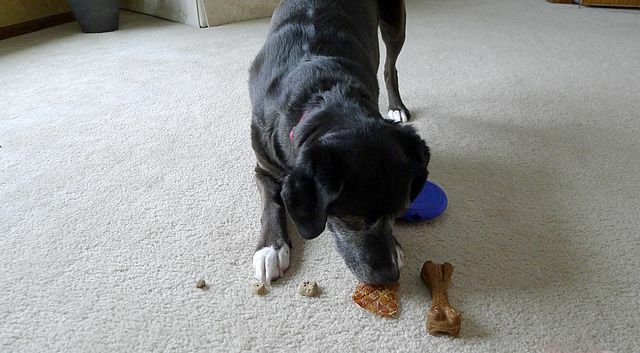 For him, dogs can only barter for objects like Haley did for a treat. But sometimes Honey will come up to me with a toy in her mouth and show the same disinterest in chasing it (or tugging it) with me. But she seems satisfied when I scratch her under her chin. So I think Honey barters for petties. My husband says it’s not bartering if it’s for attention. I have a feeling we’ll be bickering about this for the next week. Pamela’s winning the bartering debate! I do like to bring home sticks and my people trade them for treats, but I’d still be happy to just chew the sticks! Treats for sticks! That sounds like a pretty fair trade to me and much better than bringing home mice or moles for treats. My dogs don’t do this, but a friend had a lab that would steal thing (tv remote, a shoe, purse etc) and run. She would chase after him with a treat to barter her possession back. Learned behavior, hence the dog was grossly over weight. Oh my gosh, your friend’s lab probably learned pretty quick how that game worked, lol. I’m glad you stopped by, Ann! I don’t think either of my dogs have ever done this. Mostly when they want petties they just stick their heads in my lap. 🙂 When they bring me a toy, it’s usually to play tug or fetch. I’d say Haley is a pretty smart girl. Hi Jodi, It took me a long time to figure out what Haley was trying to tell me, so I feel kind of slow to learn, lol! So cute! And interesting! I guess I haven’t really thought of this either. I can’t recall Ace ever trying to trade, but he’s pretty obsessive about fetch. Although, he does like to fetch some toys more so than others. Sometimes he’ll fetch the toy I threw, drop it by me and then grab a “better” toy from his bin. So, he’s mostly just flat out taking the better toy, but now you have me thinking and I will pay more attention to this. That’s really interesting about Ace. Haley’s never done that, she always sticks with her toy of choice during a play session, even if I try to get her interested in another one (usually a less noisy one, haha). This is a really fun story, thanks :-> And the picture of Haley picking just the right trade (as opposed to all of them all at once) is sweet. Thanks Leah, I was really surprised about what she chose. I figured she would go for the biggest one! It sounds like several dogs are like Missy, they trade toys for affection. Thanks for sharing, Barbara. Yes, I think she has me trained pretty well, lol! My dog Auggie frequently does this, brings us his kong , drops it in our lap, then tries to barter for what we are eating. Auggie will also bring a toy in the kitchen and drop it at my feet when I am cooking in the hopes of some little tidbit. I do believe he is bartering, I can not think what else he is trying to accomplish when bringing us a toy and he only does it when there is food involved. We never trained him to do this, but then again we never trained him to bring shoes when he wants to go for a walk, and yet he does that too! Thanks for stopping by Janet! Auggie sounds like one smart dog. I’ve heard of dogs bringing a leash when it’s time for a walk, but bringing shoes is pretty amazing. Go Auggie! My dogs licks my palm then turns my hand over with his nose and nudges my hand above his ears. I think he is saying, “I licked you, so now you rub my ears.” He’s a poodle-chihuaha mix. Very funny little dog. He’s the only dog that has ever bartered with me but he’s a very good communicator and trainer. Not only has he trained me, but if I tell his brother and sister ‘no’, he snaps at them if they are disobedient. Thanks for sharing your story! My dog always begs at the dinner table, but she always brings me whatever is her most beloved toy that week and lays it at my feet! It never, ever works, but she keeps trying, bless her little puppy heart! I’m amazed to hear other dogs do this, and find it absolutely fascinating behavior. Really makes you wonder how intelligent they truly are.